U.S. Coast Guard 17th District Alaska Jul 20, 2018. A Coast Guard Air Station Sitka MH-60 Jayhawk helicopter aircew locates a downed aircraft inverted in Crillon Lake, in Glacier Bay National Park. U.S. Coast Guard courtesy photo. 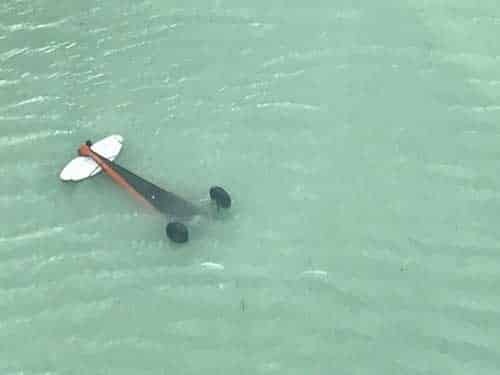 KODIAK, Alaska — A Coast Guard Air Station Sitka MH-60 Jayhawk helicopter aircrew assisted the National Park Service with rescuing a plane crash survivor from Crillon Lake shore, in Glacier Bay National Park, Wednesday. The survivor swam to a Crillon Lake shore after the crash occurred, where he was rescued by a Jayhawk aircrew. The aircrew transported him to Air Station Sitka. He reportedly sustained minimal injuries from the crash with no major medical concerns. Coast Guard 17th District command center watchstanders received a report from the Anchorage Rescue Coordination Center of a downed aircraft in Crillon Lake. The National Park Service requested assistance in recovering the survivor from the shore. Sector Juneau command center launched the Jayhawk aircrew to conduct the search. The survivor was located on the shore of Crillon Lake with a survival bag that allowed him to have dry clothing and the materials to start a fire. The Coast Guard aircrew hoisted him from a cutout in the trees along the shoreline. The cause of the crash is reported to have been from an in-flight engine seizure, causing the plane to flip and land approximately 10-20 yards from the shore.